I was born in rural Georgia, where my dad worked as a country preacher. I was kind of a misfit growing up. In fact, the bigger I got, the more misfit I became. At age 8, I got a little brother, and he was a misfit too. I dropped out of school in 10th grade, and never looked back. My brother dropped out a few years later, following in my footsteps. I’ve had a number of careers. I designed sound systems for discos. I designed effects for KISS. I designed sound systems for more bands than I could count. Then, I took up electronic game design. I worked on fire alarms and power supplies. I even worked with lasers. Finally, 20 years ago, I gave up technology to start an automobile repair business. That was where I was when my brother told some of our story in his 2002 memoir Running With Scissors. A few years later, I decided to tell my own story. 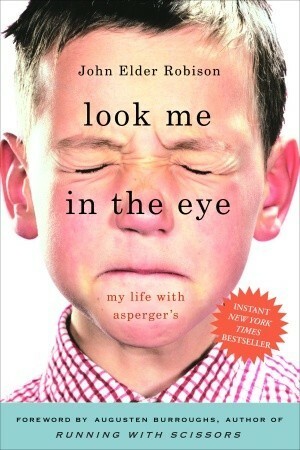 I wrote a book called Look Me in the Eye, my life with Asperger’s. Well, that kind of changed everything for me. I was, like, fully out of the closet and under the public microscope. Today, I have an active speaking schedule, I’m also involved in Asperger/autism research and I’m a member of the Interagency Autism Coordinating Committee of the US Dept of Health and Human Services. ~Brotherly Bond: Reading Look Me In The Eye gave me the strong urge to read Running With Scissors, just to see things from a different point of view. It may sound strange but I really enjoyed the chapters of the two of them together or when John Elder Robison talks about his brother. He accepts the fact that he can no longer call him “varmint” but his Asperger tendencies prevent him from calling him “Augusten”, I think it’s sweet how he comes to agree on the middle ground of “my brother” instead. Overall, an interesting memoir that I’m happy to recommend but I don’t feel the urge to continue reading the rest of his other books (however, I’m not discouraging others from doing so). However, I would also really recommend that secondary colleges exchange The Curious Incident of The Dog in the Night-time for Look Me In The Eye, I found it to be a much better representation of Asperger’s or Autism Spectrum Disorder.